Schechter Dokken Kanter Andrews & Selcer (SDK) was formed in 1990 by five men (pictured above) who left an established national firm in an effort to create a firm that made sense for clients. What resulted was our mid-size firm, focused on knowing each and every client on a personal level. We apply our intense technical training and background from the former large firm to each client situation. Schechter Dokken Kanter will be our clients’ most trusted and valued advisor by anticipating needs, delivering appropriate services, and creatively resolving complex issues. We service clients in a variety of industries with standard accounting needs such as tax, audit and general bookkeeping or business services work. In addition we are well known for our growing forensic accounting department where we provide business valuation and litigation consulting among other services. Much of our work is for clients in the private sector, however we are favorably registered with the PCAOB (Public Company Accounting Oversight Board), which makes us part of a small and select group qualified to practice before the Securities and Exchange Commission (SEC). We are also a member of the AICPA (American Institute of Certified Public Accountants) in the Private Companies Section (PCPS); the Center for Public Company Audit Firms; the Governmental Audit Quality Center; and the Employee Benefit Audit Quality Center. These memberships not only exemplify the excellent work we produce for you, they are indicative of the high ethical standards we bring to the profession as well. At SDK, we employ a group of 70 talented individuals. We are based in Minneapolis, MN, however our reach is international and our resources augmented due to our membership with Allinial Global. Allinial Global is an association of 92 independently owned public accounting firms that share educational, client service, technical and marketing resources and expertise. 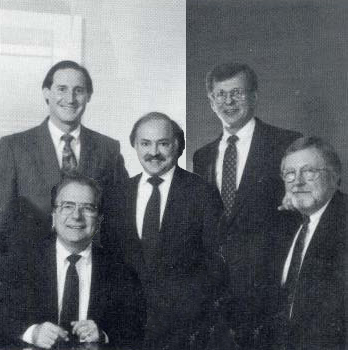 Pictured left to right: Marty Kanter, Herb Schechter, Chuck Selcer, Russ Andrews and Erling Dokken, as they were in 1990, shortly after the firm was founded.